Climate was a place before it was a kind of weather. Ancient Greek astronomers mapped the earth’s surface into “climates”, arcing between north and south poles. Their word klima (κλίμα) means “an inclination, slope–esp. the supposed slope of the earth towards the pole: hence a region or zone of the earth”. The idea of climate as a division of space lingers in 14th century English, where climates are “bands or belts of the earth’s surface … associated with specific parallels of latitude … [or] divisions of the celestial sphere”. In these cases, a climate is not distinguished by temperament, but by inclination. “Inclination” perhaps in the sense of our interest in what happens there, a space of motion in measurement. But also in the sense that it’s where our systems of measurement bend, or incline, as they contact the messy materiality of the earth itself, its slope. Today, climate usually describes a condition of atmosphere: meteorological or sometimes metaphoric (as in a political or campus climate). But even so, climate never really shakes its spatiality. Anything we describe as climatic–a fire, a storm, an act of violence or protest–matters because it happens somewhere. In one sense the struggle to describe where climate change happens is an example of how environmental harm in general defies our ability to describe, or as Rob Nixon (2011: 14) says, “apprehend” it. But in another sense, the ambiguous relationship between place and environmental condition is a specific legacy of colonialism. For Tsing the plantation is the avatar for this legacy. Plantations are places and agents of climate change at the same time. Plantations are where extraction, dispossession, and enslavement happen together; where, as Tsing (2016: 4) puts it, “living things are transformed into resources”. But more than this, plantations are portable and self-reproducing, “machines of replication”. They work by reproducing conditions of violence anywhere and reproducing anywhere as empire. We can’t think about climate change outside of the history or present of colonialism. This is a moral imperative, but it’s also just a fact. There is nothing new about how intense the effects of climate change are, including its world-destroying potential. The destruction of worlds is the operating principle of colonialism. Thinking about climate change under colonial conditions means that legal, political, and scientific concepts of place and of environmental effect are already, and inextricably, bound together. New theories of place (e.g. terraforming, space colonization) reproduce the same effects of climate change–targeted suffering and salvation–on different scales. New theories of environmental effect (e.g. the Anthropocene) disguise uneven experiences of and responsibility for climate change. So how do we think colonialism and climate change together? How do we trace the coproduction of power and ecology in historical motion? Can we map the colonial distributions of life chances without implying that those distributions are, or ever were, the only ones possible? Rather than developing new or bigger concepts of climate, Macarena Gómez-Barris, Eyal Weizman and Fazal Sheikh, and Christina Sharpe take up these questions at climate thresholds–surface, shoreline, and wake. Thresholds are spaces of accrual, passage, recurrence, and loss; where we are gathered into forms of living (bodies, families, ecologies) and cast out of them. They are also where the stakes of climate change are most intense. Today climate is no more deadly or more profitable than it is at its thresholds: coastlines, fence lines, and pipelines that rend communities and bind systems of extraction. At the same time it is at the thresholds–in protest camps, community clinics, and sanctuary spaces–that climate is reanimated as a site of care. 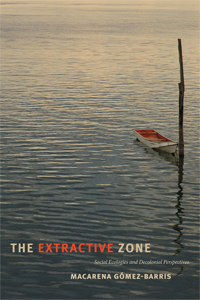 The “extractive zone” for Gómez-Barris is what’s above the surface, a space of resource extraction and the “colonial paradigm [that] … mark[s] our regions of ‘high biodiversity’ in order to reduce life to capitalist resource conversion” (The Extractive Zone, p.xvi). Like plantations, extractive zones are portable places where Indigenous land and life is changed into commodities. In Gómez-Barris’ study across five South American regions, colonial extraction takes many forms: oil-drilling, spiritual tourism, policing, hydropower, silver mining. But in each case extraction refers both to industrial actions and to perceptual ones. What she calls “the extractive view” is a kind of seeing that targets resource-rich Indigenous territories and naturalizes their exhaustion. And because governments and industries operate through systems of digital surveillance and satellite mapping that are impossible to see, the extractive view also obscures its own operation. As a result, it effects a seemingly agentless transformation of Indigenous worlds into pre-plotted resource caches, ready to be turned into profit. Although The Extractive Zone is situated in histories of South American resource extraction and Indigenous decolonization, its primary targets are commonplace ways of seeing that prioritize access and acquisition: transparency, objectivity, legibility. And so when Gómez-Barris turns “below the surface” she is interested in the decolonial potential of attending to the “muck”, to “thick water”, mixing and blurring that the extractive view avoids because it cannot apportion (EZ, p.xiii). Gómez-Barris is careful not to sentimentalize “submerged perspectives” that don’t easily translate into human political schematics. In this sense the climate thresholds she is most interested in are the edges of ourselves that we maintain through habits of perception. By framing this view as a changing relation, Gómez-Barris rethinks colonial subjectivities as effects of extractive perception. Thus, refusing to be constrained to “regimes of visual power” is also a way to open ourselves to “the transits between … human and water bodies” through which it is possible to participate in fuller and thicker political worlds (EZ, p.107). To attend to climate thresholds is to ask which forms of living pass through and which are detained, spurned, or disfigured. Those that are checked and discarded, the ones that find themselves crossed by climate thresholds, are not (contra every assurance of the state) actually erased there. Traces of belonging and survival linger as residue, at what Weizman calls the “threshold of detectability”, where life forms occur “as both material objects and as media representations” (2017: 20). Under the leadership of David Ben-Gurion, Israel began to settle the Negev–a project to which Ben-Gurion famously applied the slogan “make the desert bloom” (CS, p.23). Framing occupation as revitalization is of course an old colonial tactic. In this case, it was literally written into Israel’s property system, based on an Ottoman zoning principle in which “cultivated land was classified as mīri and was taxed. Uncultivated land was referred to as mawāt, literally ‘dead’, and came under the ownership and responsibility of the sovereign” (CS, p.51). By declaring the Negev dead, Israel erased Bedouin territorial claims and invented the logical justification for its sanctioned “revival” by Jewish settlers. In climatological terms, the threshold of the desert is called the aridity line. The aridity line is a measurement of precipitation, and is drawn where 200 mm of rain falls annually: enough to grow cereal crops without irrigation. “Since 1931,” Weizman notes, “when Zionists instituted precise meteorological measurements, the location of the aridity line has been a product of monitoring, calculation, averaging, and adjustment” (CS, p.10). Specifically, Israel’s stated project has been to push the aridity line (and therefore the desert itself) south in order to create more arable land for Israeli settlers. It is an effort that is, at best, a violent over-stabilization of a threshold that is meant to move: “Like a shoreline it ebbs in drought years and washes past its cartographic delineation in rainy ones” (ibid.). But, of course, the aridity delineates far more than rainfall. As the boundary that divides cultivated and uncultivated, it has the capacity to binarize almost any aspect of human life: domestic and foreign, valued and wasted, present and past, safe and dangerous. Sheikh’s photographs of the aridity line in the Negev are startling, gorgeous, and severe. They record a turbulent history of Bedouin living and dispossession and Israeli resettlement in almost unbearable stillness. Byzantine ruins, active and evacuated Bedouin dwelling sites, and the earthworks for future Israeli army training bases appear uncannily similar: patterned grooves and gradients dug into the honey-brown sand. Because the land holds the traces of human history so starkly here, Weizman suggests that the desert surface itself acts like a photograph: “exposed to direct and indirect contact, physical use, and climatic conditions in a similar way in which a film is exposed to the sun’s rays. Sheikh’s aerial images must thus be studied as photographs of photographs” (CS, p.15). Throughout The Conflict Shoreline Sheikh and Weizman tell the story of the Bedouin village al-‘Araqib and a Bedouin activist, Nūri al-‘Uqbi, who has campaigned for 40 years for the village’s right to exist. al-‘Araqib lies directly on the aridity line, and its Bedouin residents were first evicted from it in 1951 by the Israeli military. That eviction was supposed to be temporary but the Bedouin residents have never been granted the right to return. Nonetheless they have returned, again and again. Between 2002 and 2014 they rebuilt and were re-evicted from al-‘Araqib 65 times. In 2003, Israel crop-dusted over 400 acres of the town’s planted fields with the toxic herbicide Roundup. 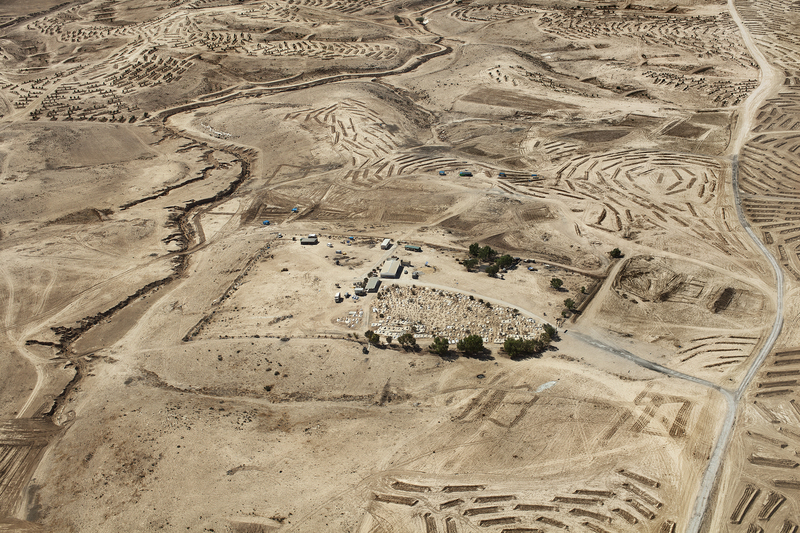 In Sheikh’s 2011 photograph of al-‘Araqib, a few protest tents and the Bedouin cemetery (the village’s last undestroyed structure) are surrounded by Israeli earthworks, preparing the land to be replanted with trees and included in the massive “Ambassadors Forest”–a state nature reserve that would permanently displace the Bedouin. Israel calls the planting of the Ambassadors Forest “afforestation”, but Weizman uses the perhaps more accurate term “plantation” (CS, p.30). al-‘Araqib is a climate threshold–where a colonial state invents itself through the violent recurrence of Indigenous erasure. All along the aridity line the state manifests itself in projects–nature reserves, training grounds, prisons, mines–designed to displace not only the present and future of Bedouin life but also the traces of its past. Sheikh and Weizman’s project is to show that even at climate thresholds, those traces gather and endure. Theirs is a “counter-forensic” method that connects those traces to ongoing Bedouin claims to their right to live in the Negev. 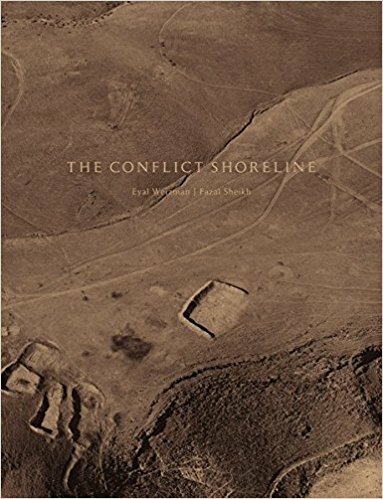 It is also a method that explicitly links the conflict shoreline with the threshold of detectability–a way insisting that the politics of climate change are always social and epistemological. In an Israeli court in 2009, Nūri al-‘Uqbi submitted aerial photographs made by the British Royal Air Force in 1944-1945. He argued that the images proved that al-‘Araqib preexisted Israel. However the resolution of those photographs is poor enough that the evidence of permanent settlement (Bedouin wells, houses, graves) appear only as blurs. In its 2012 ruling against al-‘Uqbi, the court determined that those blurs were not discernible as settlement, an act of colonial “not seeing” or “whiting out” in Weizman’s terms (CS, p.83). The blurs, however, are still there. They’re what the violent action of climate thresholds don’t wash away. And in that sense they powerfully suggest that intense and material struggle of living through climate change stretch, across place and history, through our practices of thought. The shoreline is where life is reduced to blur. A shoreline can be drawn anywhere that colonial power weaponizes the mediated interface between life and land. It is a concept of climate threshold where catastrophe is never only a future but a recursive present, centuries old. However, climate thresholds are also drawn onto life itself, where the blur is not a perceptual distortion of empire but an ontological one. This is to consider the racial operation of colonialism and to insist that it too is climatic. But to do so requires a concept of threshold that’s not incidental (specifically, that’s non-evental). One that can express the way that the environmental expansion of empire is not external to life; that the blur has been made to emanate from the body, not the body’s contact with photograph or land. As a way of thinking about climate, wake is very different from surface and shoreline. It takes a different preposition: not above or below, or at, but in the wake. Christina Sharpe writes that “to be in the wake is to occupy and to be occupied by the continuous and changing present of slavery’s as yet unresolved unfolding” (In the Wake, p.13). It is ontological (“to be ‘in’ the wake”) because it describes Black life in the time and space of the antiblack world (IW, p.14). It is, in this sense, a global operation but not a comparable one: “The suffering of Black people,” Sharpe observes, “cannot be analogized” (IW, p.29). In the Wake: On Blackness and Being might be described as a field-changing book. But “field” is a vexed and simply insufficient metaphor here. It has been celebrated both by specialists across disciplines and was named one of the best books of 2016 by The Guardian. It is at once meditative and theoretical, stylistically meticulous and spacious, intensely personal and a work of assembly. 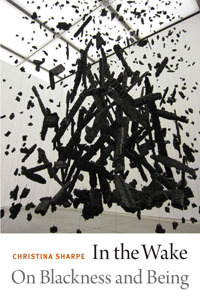 It is exemplary of a category that perhaps only it could invent, “wake work”: “plotting, mapping, and collecting the archives of the everyday of Black immanent and imminent death, and … tracking the ways we resist, rupture, and disrupt that immanence and imminence aesthetically and materially.” (IW, p.13) It is specifically situated in Black life and Black study. So, insofar as a field like environmental studies is understood to be separate from Black studies, In the Wake can’t be positioned as an environmental studies text. Environmental studies, however, is incomplete without it. Although ocean water is a particular (if massive) substrate, the wake of the ship is a good example of the book’s broader rethinking of the time, location, and substance of climate disaster. 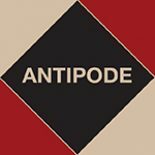 When Sharpe writes “antiblackness is pervasive as climate”, it is not a metaphor but an account of how the environment is constituted through colonialism as an archive and vehicle of antiblackness (IW, p.106). Disaster, thus, is wildly nonscalar–always mundane and extraordinary–as a function of the way any environment is materially animated by the ongoing histories of colonialism. Where wake shares more with the threshold frameworks of surface and shoreline is as a condition of gathering and observance. Of course, Black practices of mourning, memory, and care, like suffering, occur at specific proximities of life and death. And so here again, the particular way Sharpe theorizes wake as a visitation and ceremony for the dead–a theorization she makes specifically in the context of her own family–is not generalizable. At the same time, the way that Sharpe connects the memoried and ritual observance of the dead as critical attention and care has much to teach anyone interested in how to live within ongoing conditions of harm. One kind of wake work is what Sharpe calls “aspiration”. Not aspiration in the neoliberal sense of desire for class ascendancy, but as a matter of breath. Specifically, she considers “what it takes, in the midst of … the virulent antiblackness everywhere … to keep breath in the Black body” (IW, p.109). Breath is a transit of air that marks the threshold between life and death. Sharpe tracks the ways Black breathing has served as tool of regulation of that threshold by colonial officials from slave ship crews to the NYPD. Aspiration as wake work is attention to and gathering in the ongoing histories of that management and resistance to it. It is also an example of a broader category she calls “enfleshed work” (IW, p.21). As a practice of climate analysis, enfleshed work happens at the thresholds. Work that actively participates in the material transit between human bodies, places, conditions, and the ongoing present of colonialism at every level, requires finding and learning how to stay in those thresholds. It is a question of learning to think in and with the muck, the blur, the wake. This entry was posted on 13 February 2018 by Antipode Editorial Office in Reviews and tagged afforestation, biodiversity, black geographies, climate change, colonialism, commodification, deserts, detectability, dispossession, ecological change, empire, enclosure, environmental change, erasure, extraction, filmmaking, geographical scale, indigenous sovereignty, Israel-Palestine, mapping, memory, mourning, natural resources, Negev/Naqab, plantations, racism, slavery, surveillance, the Anthropocene, the Black Atlantic, the body, violence, visuality.